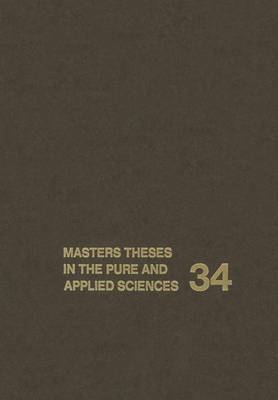 Masters Theses in the Pure and Applied Sciences was first conceived, published, and disseminated by the Center for Information and Numerical Data Analysis and Synthesis (CINDAS) * at Purdue University in 1957, starting its coverage of theses with the academic year 1955. Beginning with Volume 13, the printing and dissemination phases of the activity were transferred to University Microfilms/Xerox of Ann Arbor, Michigan, with the thought that such an arrangement would be more beneficial to the academic and general scientific and technical community. After five years of this joint undertaking we had concluded that it was in the interest of all con- cerned if the printing and distribution of the volumes were handled by an interna- tional publishing house to assure improved service and broader dissemination. Hence, starting with Volume 18, Masters Theses in the Pure and Applied Sciences has been disseminated on a worldwide basis by Plenum Publishing Cor- poration of New York, and in the same year the coverage was broadened to include Canadian universities. All back issues can also be ordered from Plenum. We have reported in Volume 34 (thesis year 1989) a total of 13,377 theses titles from 26 Canadian and 184 United States universities. We are sure that this broader base for these titles reported will greatly enhance the value of this important annual reference work. While Volume 34 reports theses submitted in 1989, on occasion, certain univer- sities do report theses submitted in previous years but not reported at the time.